Great evenings in the outdoors can easily be thwarted by pesky mosquitoes. 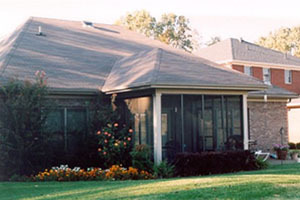 A screen room offers an effective and economical way to make sure your guests are comfortable in your backyard. Never sacrifice an outdoor dinner party again! 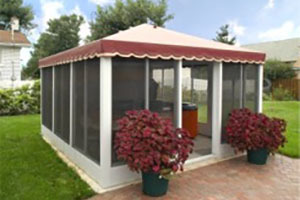 All of our screen enclosures and gazebos are designed to withstand the wind and rain and are easily installed by the homeowner. 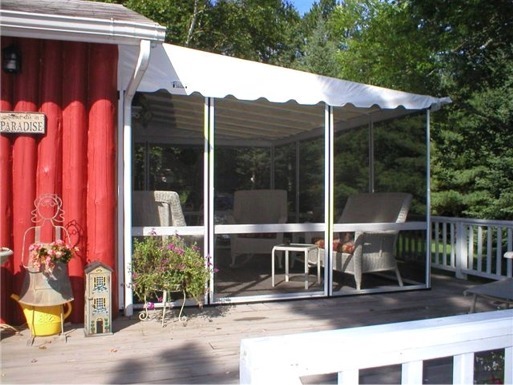 Install your own outdoor screen room in your backyard patio, on your summer trailer getaway or even enclosure your front porch by using our screen walls only system. There is no place that cannot be protected from the bugs or the weather. Most of our systems can also be converted to a 3 season room with the additional of vinyl lip frame windows. Enojoy more time in your outdoor haven, protected from West Nile, Zika or whatever is next. Our longstanding relationships with manufactureres ensure we deliver a high value, durable and easy to assemble units. All made to withstand our difficult Canadian climate. Stand-alone or 3-sided wall attached units. We've got 'em! 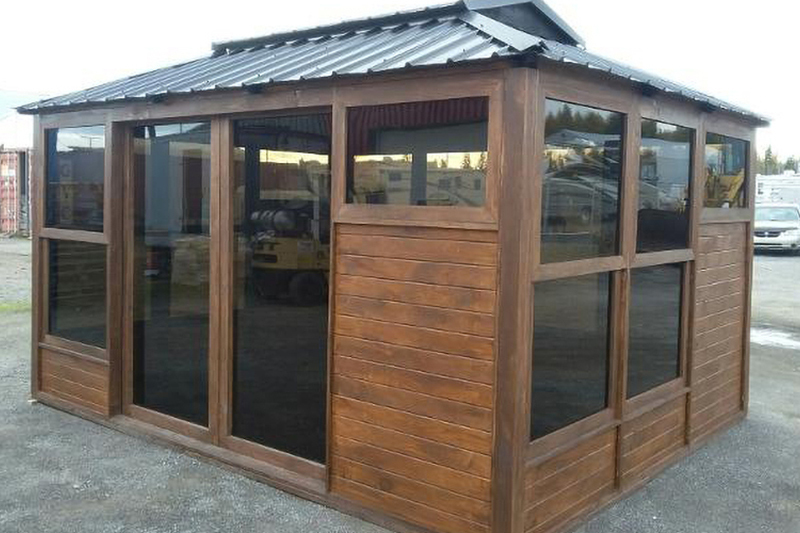 Prestige wood gazebo with modular design capabilities. Like adding a new room your your house. Always protected from the weather. Click on any of the pictures below to go to pages with more information and pricing. If you have questions or wish to explore options for your screened enclosure project, please call or email. We have the largest selection of screen enclosure kits that attach to your existing house wall or fascia board. With applications for your home, cottage or trailer, there is no limit to the possibilities. 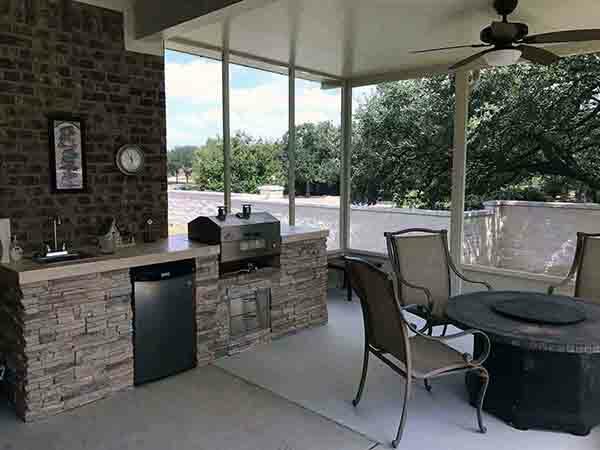 Choose from permanent hard top systems or vinyl top screen houses that are specifically designed to go up in the spring and come down for fall storage - - the choice of trusting Patio Concepts is a clear one! Already have a porch or patio roof? 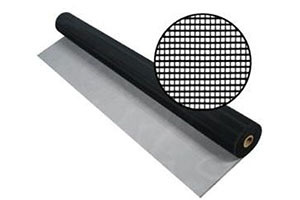 Easily enclose your porch or screen in your deck today with this screen wall only kit! This "materials supplied" screen enclosure kit is designed to add beauty and a functional 3 season living space to your home. YOU BUILD IT so you can get a custom screen room to your exact measurements and fit to any space you have. 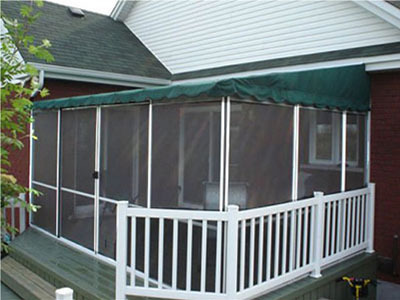 Our custom porch screening kits are available in a range of colors and screen styles. 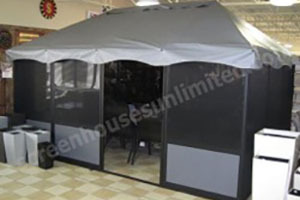 A modular gazebo that stands out for its modern look, easy customization and installation. The use of quality materials ensures its durability against harsh winter weather. In addition, you can arrange your modules in the order you want including the location of the door. 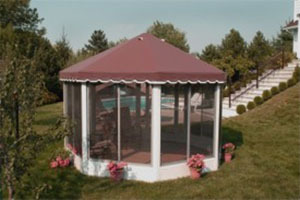 The traditional Gazebo shape continues in its popularity! 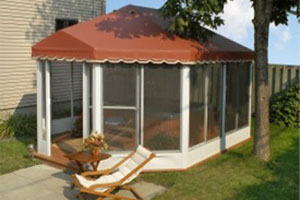 With four represented manufacturers of this style of enclosure, once again Patio Concepts is the one to turn to. Choose from a wide variety of sizes and colours - both permanent rooms and those that store away for the winter. Rectangualr free standing patio room kits on your deck or patio will allow you to start enjoying the outdoors, without the mosquito, as well as with protection from the sun, wind and rain. With a good selection of sizes and two different qualities to choose from there is nothing standing in your way of finally getting the screened enclosure you want! Do it yourself free standing patio room kits on your deck mean you can start enjoying the outdoors away from the pesky mosquitos, while being protected from the sun, wind and rain. We offer an assortment of sizes and different qualities to choose from there is nothing standing in your way of finally getting the screened enclosure you want! A selection of patio enclosures from our line that are great options to enclose your spa or hot-tub. Freestanding, easy to assemble, do it yourself spa enclosure kits add another dimension to your outdoor spa experience.